In April 2010 Palestinian terrorists stabbed five family members to death in the Israeli settlement of Itamar; three children, including a baby girl, were among the victims. The killers slashed the baby’s throat. Later that day Palestinians handed out candy to celebrate the mass murder of an innocent family. Only two children survived. 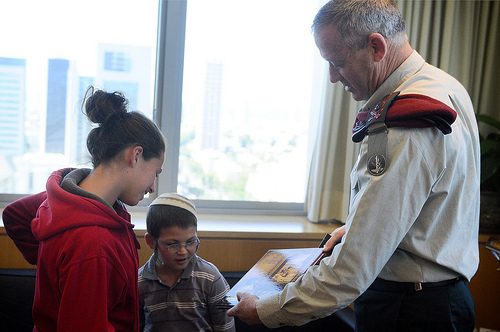 The children later met with the leader of the Israeli Defense Forces. Twice this week relatives of the Fogel family murderers praised the two killers on Palestinian TV. In August an Israeli court sentenced Hakim Awad to five consecutive life sentences for his part in the Itamar settlement massacre. Awad’s cousin Amjad was also sentenced to five life sentences and an additional seven years for brutally stabbing to death Udi and Ruth Fogel and three of their children: Yoav (11) Elad (4) and four-month-old baby Hadas, last March. The aunt went on to read a poem she had written in the murderers’ honor, while Hakim Awad’s mother sent her regards to her son and proudly mentioned that he was the perpetrator of the Itamar massacre.